Hiroco Ponissi, a standard jazz vocalist with her charming singing style, creates a distinct “one-and-only” work, integrating her various talents as an opera producer/production coordinator, and costume designer. Born in Tokyo, she studied fine arts, sculpture, video art and computer graphics in School of Visual Arts in NYC, joined Group New York and studied Method Acting of Maestro Lee Strasberg. Hiroco also took classical vocal lessons from Alex Yancy and jazz from Lance Hayward, and is taking Baroque from Hirata. She made her debut as a canzone singer in a NHK radio show and restarted singing jazz in 2010. In 2011 she released a jazz ballad CD “How long has this been going on? – Hiroco Ponissi made in Italy -”. In 2012 she sang at Kichijoji Music Festival and Sumida Street Jazz Festival, as well as in jazz clubs. 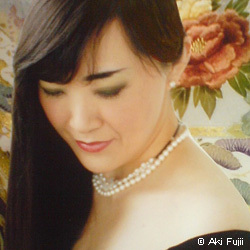 Her appearance on the TIMM stage is supported by Junko Nishida, the talented fairy on piano. Be ready for their “wild” and “mild”!